There doesn’t seem to be any sort of spell or effect that will selectively let you remove a limb from another creature. It’s not hard to see why this is, since a few such castings could quickly descend into the realm of Monty Python and the Holy Grail’s Black Knight; or even just one-off decapitations all over. Nevertheless, what would a spell with the ability to sever limbs look like (and what would be the game effects of losing an arm or leg)? Yes, this is another question from Alzrius. Well, before I try to create a rule to implement amputations and crippling injuries, it’s well worth taking a look at the problems involved. 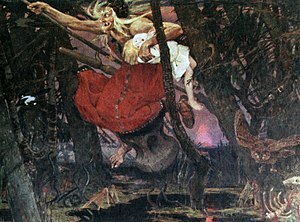 Of course, Baba Yaga is set during World War II, and – while it does allow a wide variety of magical creatures – has reasons for using the human model for all of them. It doesn’t explicitly cover the difference between wounds for horses and bears and dolphins and wounds for humans, but it doesn’t need to; those differences will never really play a major role. Coming up with some rules for wounds for a human with a wounded or lost leg are easy. Now, how about centaurs? Dragons? Giant spiders? Golems? Animated objects? Energy beings? Shapeshifters? Thousand-tentacled creatures of living fire? Abominations from beyond with shapes that we cannot even define in mere three-dimensional space? Do golems have vital organs? Can they bleed? Now, repeat this for every major organ, including organs that humans don’t have equivalents for, but other creatures do have. Wait a moment… is the “organ” that produces a dragons breath weapon a physical one at all, or is it a magical “organ”? Can magical organs be wounded? Why not? What about psychic organs? Can you wound the spirit? The soul? The life force? (Whatever that is). How about morale? I can see adding some spells and effects that would do that. Uhm… We’re going to be bloating every creature and racial description by quite a few pages here. Since we’re trying to be “realistic”, we’ll need a breakdown on how their bodies actually work so that our systems will make some sort of sense (which will annoy the people who like to come up with their own details and have some different ideas), then we’ll need a list of all their major parts, and what happens when they’re injured, and what happens when they’re rendered non-functional or amputated. Then we’ll need a hit location system and some system – perhaps fortitude saves – for resisting such injuries, and perhaps a system to determine how long such a wound would take to heal without magic. Is this really worth doing? I don’t run a lot of combat, but a typical d20 game does. Won’t quite a lot of those creatures appear once and get killed? Will all this detail actually add much of anything to the game? Of course, the players are likely to hate it when their character has to deal with a crippling long-term injury. That isn’t very heroic – and quite a lot of gamers get rather uncomfortable when you start having legless beggars and crippled children intruding on the setting. Most people like their fantasies full of clean victories and dramatic battle wounds that heal quickly leaving nothing but a suitably distinguished scar. Nobody likes playing “dying slowly of a suppurating gut wound” – and they, quite rightly, may feel that crippled NPC’s are an unfair attempt to take advantage of modern scruples. The increase in “realism” with such a set of rules almost certainly isn’t worth it in d20 – and it’s probably not “realistic” anyway, at least in terms of the whatever physics is at play in a d20 fantasy universe. These are worlds where an ordinary human can have a child with an animated rock or immaterial ghost, generate vast forces with their unaided brain, learn to shapeshift, and be instantly healed by infusions of “positive energy”. Conventional biophysics is routinely overruled in most d20 universes; trying to make injuries consistent with real-world biology is like swallowing a whale and then choking on a sardine. That sort of thing is why basic D&D, back at the very beginning, opted for generic “hit points” – and it was probably a good decision. Other methods may suit other games (as is discussed here, in “RPG Design – Realistic and Unrealistic Injuries”), but d20 just has too many weird factors and creatures for it to work well. Fortunately, if you do want to simulate this sort of thing, the game already has a mechanic to use; simply treat it as a Curse. You can reduce an attribute, reduce the ability to act, make individual limbs useless, reduce movement, and produce many other effects tailored to the target according to the descriptions for curses. Go ahead and upgrade your curse with range, or greater power, or whatever you like if you’re using The Practical Enchanter, since it has a far more elaborate curse system and a system for modifying spells as well. A character or creature with a BAB of at least +3 may reduce the damage from any single attack by twenty points (to a minimum of zero) by taking on a specific injury equivalent to a Curse or similar effect (Blindness, Deafness, Etc) specified by the attacker. Such an injury requires a specific third-level spell to repair or a Heal spell. A character or creature with a BAB of at least +5 may entirely eliminate the damage from any single attack by taking on a specific injury equivalent to a double-strength curse specified by the attacker. Such an injury will require a Regenerate spell and a full nights rest to repair. Unless the attack is going to kill you, this is rarely a bargain. After all, a double-strength curse can result in complete paralysis, -12 to an attribute, or some similar utterly crippling penalty. A character or creature with a BAB of at least +8 may suffer a permanent and irreversible curse chosen by the attacker and game master in consultation to mysteriously disappear – toppling into a sudden crevasse, over a cliff, dragged off by a supernatural horror, or whatever – after any attack which should have killed him or her. He or she will be back later. Anyone who pulls this more than once is probably going to be hopelessly crippled, but it may be worth it in games where you can’t be raised or resurrected. There. That provides options for an immense variety of specific injuries, each tailored to the type of opponent and how the injury was inflicted. It also limits such injuries to tolerably important figures to reduce the record-keeping, turns taking a long-term injury into a possibly-advantageous strategic choice for the player characters rather than an adventure-ruining vagary of the combat system, and helps avoid random player-character and important NPC deaths. If you’re going to inflict crippling injuries on the player-characters, you might as well make sure that they’re glad to have them. Why BAB instead of level? Because warrior-types really ought to be best at surviving massive injuries and attacks, with the semi-warriors after them. If you’d rather use level, go ahead; the requirement is just there to keep every city guard and random goblin from sitting up after a fight and staggering off to hunt for a cleric.